Annick Goutal has launched Chat Perché, a new fragrance for "grown ups and little ones starting from 3 years old". Out in the country, children discover with wonderment the joys of nature. Running barefoot through the grass, playing tag, blowing dandelion seeds… And if the cat washes behind its ear to bring rain, it is for children to jump in puddles and spot shapes in the clouds. Chat Perché was developed by perfumer Isabelle Doyen. The notes include nasturtium, sweet pea, green notes, lemon blossom and white musk. 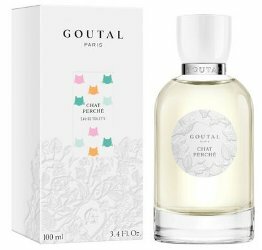 Annick Goutal Chat Perché is available in 100 ml Eau de Toilette. My gosh. That ad copy?! What in the world? Ummm.. huh? Is this a thing or is it just weird translation? Ok.. I kind of thought it might be something like that. Yeah, I had never heard that. Oh lordie that ad copy. I do love sweet pea and will certainly give this a try! Would SmokeyToes the cat would give a paws up? Nope, I’m afraid not. SmokeyToes is not amused. Adorable. Those kitties, that bottle. The scent of nasturtium is gorgeous. They had me hooked until white musk. Maybe a native speaker could confirm if it is still in usage. Ahah! Then the name would make sense. A children’s game. Thx! I looked at the AG website and they have scented pencils to go along with this one (scented with Chat Perche of course). Love the name but don’t like the notes. Pass. Aww, how sweet I used to wear a sweet pea perfume many many years ago (really more of a perfumed water that I picked up at a bath & body boutique.) I wonder if this smells similar. Anyone else uncomfortable with a fragrance targeted at “…little ones from 3 years old”? I know I am, & I don’t mean to be a wet blanket. When I saw a number of comments on this post, I was positive that NST’ers were discussing this particular aspect of the announcement. So I was surprised when I read almost to the end before seeing anyone expressing exactly what I thought. Children at 3 do not need any perfumes – not even to play in “being grown-up/like mom,” and their parents do not need this idea of giving their child a spritz put in their head by the brand (because some of them will). I appreciate your agreement with what I said & your thoughts on the subject. To those who commented after me, I still think there’s a vast difference between a mother applying her fragrance to her child as a treat & a business launching an advertising campaign targeting such young children (& their parents, per Undina’s comment). After my mother would wash my hair, as a treat, she would add a few drops of scent on my head–made me feel very special. Same for all my cousins. Very common for European families, I believe. And in Latin America, as well. There you go. And we survived, claro!